at 9:00 am at the home of Pet and Richard Smith. chairs an containers for fish. 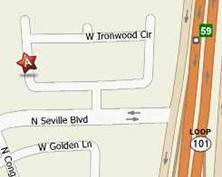 follow to 3096 W. Ironwood Circle. From the Northwest/Northeast: Loop 101 south to Warner exit. Follow directions above. From the East/Southeast valley: US 60 to Loop 101, south to Warner Exit and follow directions above. The March meeting was held at the residence of Karen Valenzuela. A speaker from the Herpetological Society talked on desert reptiles and tortoises. He brought several non-venomous snakes for show and tell and the younger set enjoyed carrying them around. He also talked on the Gila monster and Mohave rattlesnake. There were quite a few members in attendance and the weather was perfect. Six sites have been established for pond tour ticket sales. There will be 5 homes on the tour. Help is needed in making signs and all signs from last year should be returned for reuse.